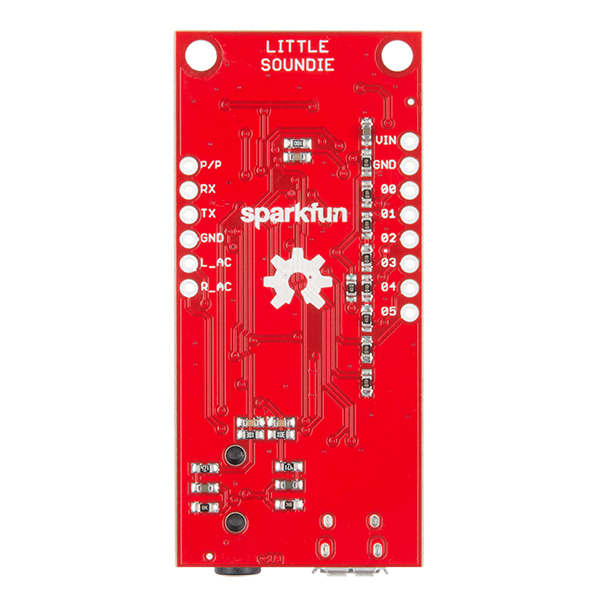 The SparkFun Little Soundie is a fun and easy-to-use audio playback device breaking out the VS1000D audio codec IC allowing this little board the ability to decode OGG Vorbis and WAV type files. 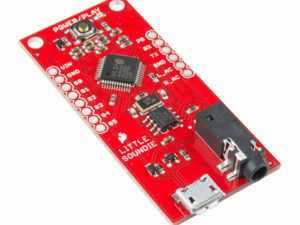 The Little Soundie makes adding sound effects to your project, prop, or costume easily with the built-in USB mass storage for your audio files and simple methods of triggering audio playback. Beyond playing back your chosen audio files, the Little Soundie is remarkably easy to set up, with just four simple steps: connect to your computer using a micro-USB cable, press the power/play button, format the disk when prompted, then just drag and drop your .ogg or .wav files! 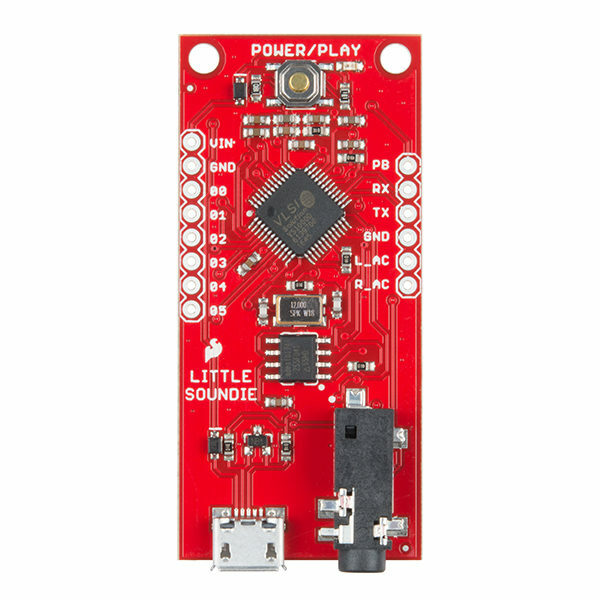 There are five areas on the Little Soundie that allows you, the user, to interact with the board, the Power/Play button, the trigger pins, the 3.5mm jack and micro-USB port, and the VSIDE pins and each of these areas provide different functions for operation. The Power/Play button is pretty much what it says it is, it turns on the VS1000D which then triggers all the internal voltage regulators. 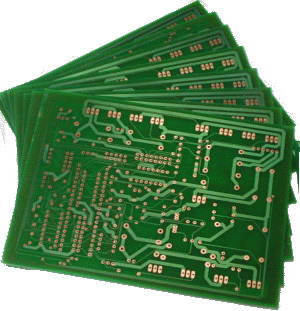 The trigger pins on the left side of the board activate each track on the Little Soundie based on a binary code while a momentary connection to 3.3V will trigger the audio to playback (we go into good detail about this in the Hookup Guide below). The 3.5mm jack and micro-USB connector provide your input and outputs for the board. 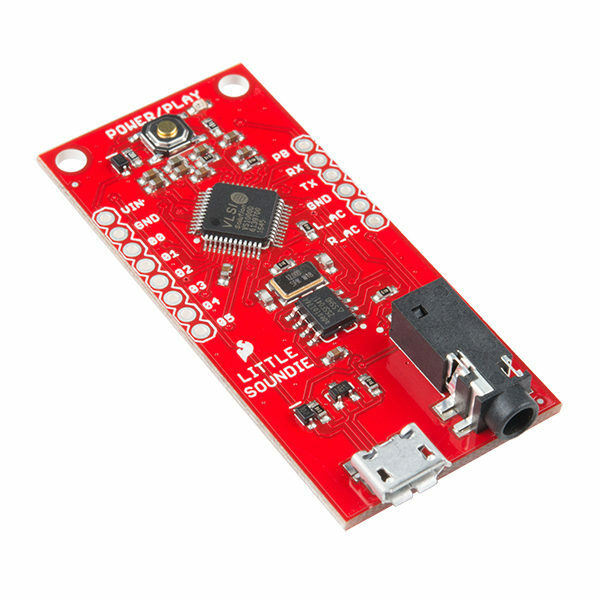 Finally on the right side of the board are the VSIDE UART programming pins which allow you to change or add any functionality of the Little Soundie through the IDE. Note: Speakers are required for the Little Soundie, not headphones. Headphones wont break anything but you wont get any sound either.